Make us your go-to professional roofers for your Alliston, ON home. Is your roof project overwhelming and you just aren’t sure where to turn? Maybe you just need a simple roof repair, but don’t have a professional roofer to complete the job. Finding a professional roofer doesn’t have to be a chore. Let our professional roofers at Slippery Slope Roofing be your next call! Roof Repairs –Something as simple as new shingles to fix a roof leak is easy for our professional roofers. Don’t wait for the problem to get worse! We provide detail-oriented, efficient work that will fix any repair, large or small. Roof Replacement – Damage to your roof or simply old age can cause you to need a new roof. Our professional roofers provide a roof replacement service that doesn’t take shortcuts. We pride ourselves on quality workmanship and efficient service. Roof Installation – Don’t rely on just any company to complete your roof installation project. 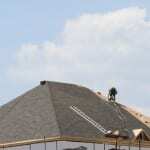 Our professional roofers focus on only one roof project at a time – yours. That means you get the roof you always envisioned during your roof installation without sacrificing quality. If you are in the Alliston, ON area and you need professional roofers for a roofing job, whether small or large, we are your go-to roofing team. We will provide affordable options and quality workmanship that you won’t be able to pass up. With 50 years in the roofing business and focusing on only one job at a time, you won’t regret calling us for all your roofing needs. Call today for more information! At Slippery Slope Roofing, our professional roofers proudly serve Alliston, Barrie, Orillia, Bradford, Newmarket, Midhurst, Cookstown, Beeton, Innisfil, Angus, Collingwood, Wasaga Beach, Oro-Medonte, Midland, New Tecumseth, Clearview, Bradford, Essa, Stayner, Springwater, and surrounding areas of Ontario.